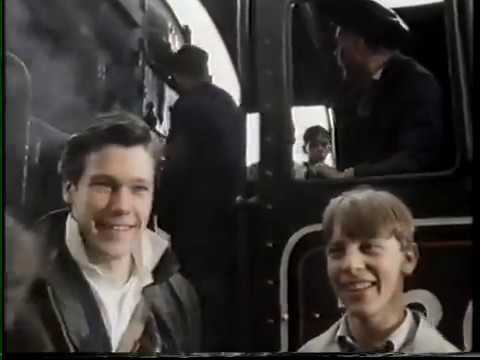 This may be Song of Experience (1986), a BBC Screen Two production. As the boys wait at the station, a train approaches in the charge of BR Standard 5MT 4-6-0 73081 [I][B]Excalibur[/B][/I]. Only problem is this engine belongs in the south of England, not "oop north". Following the age-expiry of LSWR/SR King Arthur class locomotives, which carried names of places and characters associated with the legends of King Arthur, several 73000 series BR Standard 5MTs were transferred to the Southern region to replace them. As a consequence, it was decided to name the engines after a selection of the "retired" SR class N15s. SR/BR (30)736 carried the name [I][B]Excalibur[/B][/I] and that name was subsequently transferred to 73081. I frequently wonder whether such historical and/or geographical inaccuracies would be acceptable in the case of motor vehicles and/or aircraft .... ?